Just a quick howdy to let you know that the March calendar (view) is now out, which means registration is now open for the March Make N Takes. Please note there will now be FOUR sessions since there seems to be a growing demand to make cards and support Relay for Life - whoop whoop! The days and times are Friday (5:00pm - 8:00pm), Saturday (10:30am - 1:30pm OR 2:00pm - 5:00pm) OR Sunday (2:00pm - 5:00pm) - phew!! Beginning in April there will be a second group of Journal Jammers, who will meet on the fourth Saturday of the month. Please contact the shop (386-454-8008) if you would like to be included. 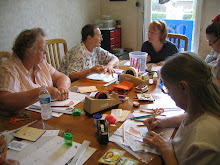 Also check out the NEW Scrapbook class being offered by Louise Damon and "Fairies in a Jar" being taught by Cynthia Shiver. Boy, the shop is hopping!